Thai anti-government protesters have opened fire on government supporters during clashes in Bangkok which left at least 11 people injured, officials say. The incident came after the People's Alliance for Democracy blocked the road to the city's old airport in a renewed attempt to unseat the government. The PAD said on Sunday it had begun a "final battle" to achieve the goal. 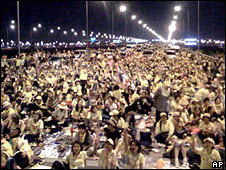 Meanwhile, PAD supporters have stormed Bangkok's main international airport, leading it to suspend outgoing flights. Witnesses said hundreds of yellow-shirted members of the group managed to break through police lines and enter the main terminal of Suvarnabhumi airport, to the bewilderment of passengers. The airport's manager, Serirat Prasutanon, said the authorities had tried to negotiate with the protesters, "but to no avail". "For the safety of passengers, we have to stop flights out of the airport temporarily until the situation returns to normal," he told the Associated Press. Exactly what the protesters hope to do there is not clear, the BBC's Jonathan Head in Bangkok says, but they may be hoping to prevent Prime Minister Somchai Wongsawat from returning from the Apec summit in Peru on Wednesday. Mr Somchai told reporters in Lima: "Anyone who wants to overthrow or resist the government is attempting a rebellion." 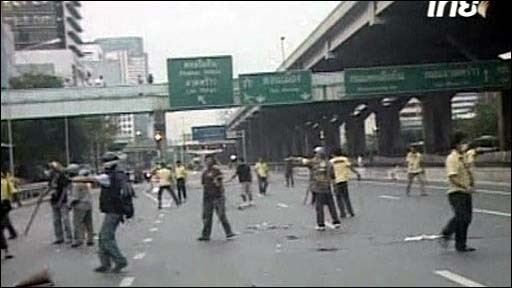 Earlier, Thai TPBS television broadcast pictures of the violence on the main road to the capital's old airport. The footage showed shots being fired from a truck into crowds after rocks were thrown. At least two handguns could be seen and people standing with the gunmen raised up a picture of the revered Thai king, whom the PAD claim to be supporting. Protesters could be seen running across the empty multi-lane road and setting fire to a motorbike. A man was also seized by pro-government supporters and what appeared to be a large knife was held to his throat. TPBS said its cameraman had been threatened at the scene and that PAD personnel attempted to seize his tape. On Monday, PAD protesters converged on Bangkok's old Don Muang international airport, from where the cabinet has been operating since its offices were occupied three months ago. Organisers say the protest is a "final battle" to bring down the government. Our correspondent says the government appears to have followed a strategy of allowing PAD to attack government buildings while avoiding clashes, in the hope that it will wear the protesters down. The government has so far resisted calling in the army. Analysts says it is a thinly disguised aim of the PAD to provoke such a move. The PAD are determined to create drama but many ordinary Thais are sick of the unrest and the protesters appear to be losing steam, says our correspondent.